“The Theory of Everything” sounds like a fantasy or a David Bowie song. Turns out it’s a pretty good Theory and feature film. Stephen Hawking (Eddie Redmayne from “Les Miserables”) is a doctorial candidate at Oxford. He’s a little quirky and brilliant and is still trying to find a good subject for his thesis. He wants to find something unbelievable and make people believe it. He finds Jane (Felicity Jones from “Hysteria”) and spends his life trying to understand her and her love. He also comes up with a theory of how the universe started. About the time he meets Jane, he finds out he has Lou Gehrig’s Disease. The doctor gives him two years to live – and that was in 1963. What the doctor did not know was since he met Jane he’s had something to live for. He also did not know that Hawking had a rare slow-progressing form of the disease. That is the way I describe the love affair with my wife – rare and slow-progressing and something that will be with me for the rest of my life. 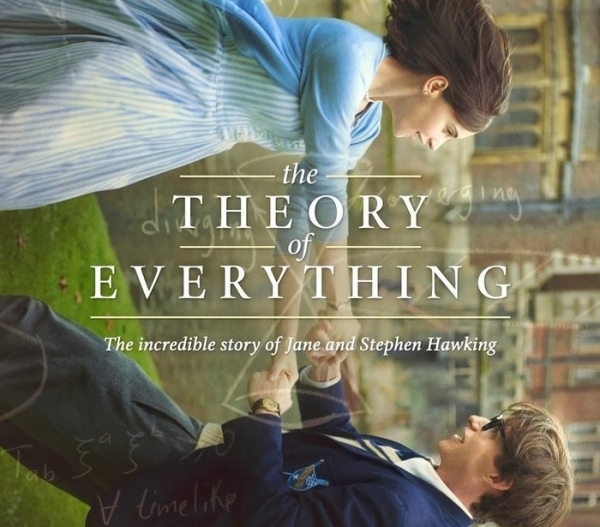 This movie is based on Jane Hawking’s autobiography, so it’s her story, about her life with him. Believe me, the woman behind the man is often more amazing than the one in the limelight. Like most true-life stories, they can’t show us everything. Maroon 5 tried to cover it in their album “Songs About Jane,” and Hawking tells us more with his tears than his bestselling books. His universe started when he met Jane, and that spark will stick with him forever, even if they aren’t married anymore. That is the puzzle he will never solve, even though he knows it is true. For that reason I must give this movie 4 stars out of 5. Loving a good woman may not be everything, but it’s a theory I prove every day.